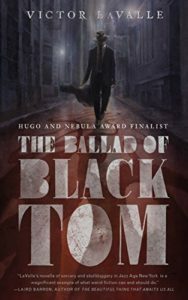 What has stayed with me in the months since I read The Ballad of Black Tom? The sense of teeming New York in the 1920s, the deft characterizations of the divides among black and white, the delicious irony of seeing an H.P. Lovecraft tale told from a black point of view. The story is eventually one of cosmic horror and personal tragedy, but there is plenty of humor along the way. “Dad played guitar and Mother could really stroll on a piano. It was only natural that Tommy Tester ended up drawn to performing, the only tragedy being that he lacked talent. He thought of himself as an entertainer. There were others who would have called him a scammer, a swindler, a con, but he never thought of himself this way. No good charlatan ever does.” One of the many ironies of this novella being that he is brought into a role because he is a good charlatan and winds up doing things that are far more real than either he or his hirers expect. Tommy’s con is that he doesn’t play the guitar very well, but he definitely looks the part. Looking the part gets him hired to play a very special party thrown by an eccentric but wealthy elderly white man who lives far out in Queens. Riding out to that borough, Tommy increasingly stands out among the passengers, and draws extra attention from the conductors. Fellow riders pretend not to hear his exchanges with the conductor, but he can tell from their nonchalant alertness that they are in fact very interested in what he is up to. The walk from the station to his would-be benefactor’s house is another obstacle course for Tommy to navigate, and that fact says plenty about race relations then and now. “Becoming unremarkable, invisible, compliant — these were useful tricks for a black man in an all-white neighborhood.” Mm-hmm. Tommy picks up a little money in more esoteric matters, too. “This is how you hustle the arcane. Skirt the rules but don’t break them.” The combination connects him to Robert Suydam, who lives “in a mansion hidden within a disorder of trees.” As the story progresses, there is more hiding, and more disorder, and more than almost anyone bargained for. By the end, readers have plenty to chew on about monsters and justice, cosmic presences and simple human dignity. 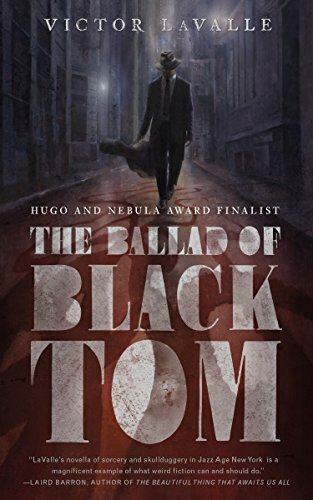 The Ballad of Black Tom was the first bit of Hugo reading I completed this year, and the last one I will be writing about as such. I am looking forward to finishing Too Like the Lightning and Words Are My Matter, both of which I ranked very highly on my ballot because I could see where they were going and where they stood compared to the other finalists. I was pleased, honored, and satisfied to be a Hugo voter this year, to give back a very small part of what the works recognized by the award have given to me over the years.